“Happiness is a cigar called Hamlet”, one of Greg Denieffe’s old beer mats [American English: coasters], probably from 1979. After my piece about rowing in William Shakespeare’s work, which was published on 29 April, my dear honourable HTBS colleagues Greg Denieffe and Tim Koch contacted me saying that I had missed out the rowing connection with Hamlet. No, no, not Shakespeare’s Hamlet, but “Hamlet”, the mild cigar manufactured by the tobacco company Gallaher Group, which made its cigars in Cardiff, Wales. Hamlet cigars were first launched in the UK in the beginning of the 1960s. What is still remembered is the advertising campaign that surrounded this tobacco product, “Happiness is a cigar called Hamlet”, which was running on television until tobacco ads were banned in the UK in 1991. Five years later, the Hamlet ads showed up in cinemas, but when tobacco products were banned there also, in 1999, the last advertisements were reworded slightly, “Happiness will always be a cigar called Hamlet”. 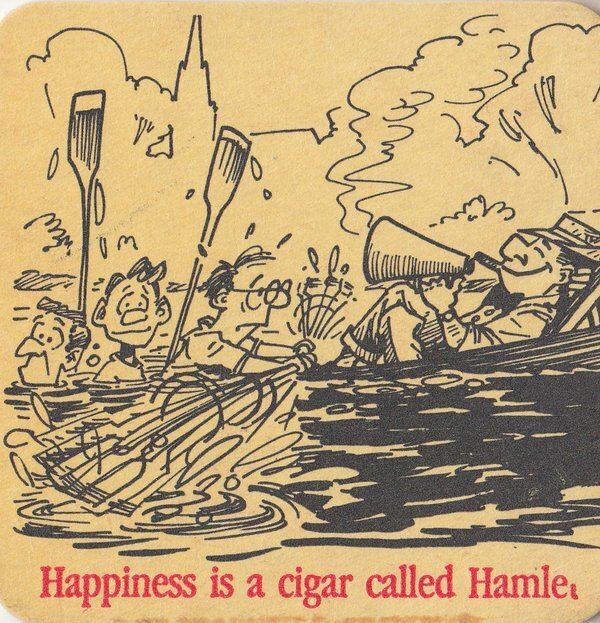 In 1966, the slogan “Happiness is a cigar called Hamlet” and the campaign were created by the advertising agency Collett Dickenson Pearce & Partners (CDP), founded in the early 1960s in ‘Swinging London’. During the 1970s, the company was regarded as one of the finest in the world. It ceased business in 2000. According to the Wikipedia entry “Happiness is a cigar called Hamlet” the campaign idea was of a man who ‘finds himself in an awkward or embarrassing situation and lights a Hamlet cigar. Lighting and smoking this cigar makes him smile and forget his woes. The campaign branched out from traditional advertising, even publishing a book of cartoons based on the idea.’ These commercials used an excerpt from Bach’s “Air on the G String”, however a jazzed-up version played by French pianist and composer Jacques Loussier and his trio. The cox in the scene is one of Britain’s most beloved comedians, Ronald ‘Ronnie’ Corbett, who sadly died on 31 March 2016, at the age of 85. Gallagher’s weren’t the only tobacco company in the ‘swinging sixties’ to embrace British rowing. John Player & Co. 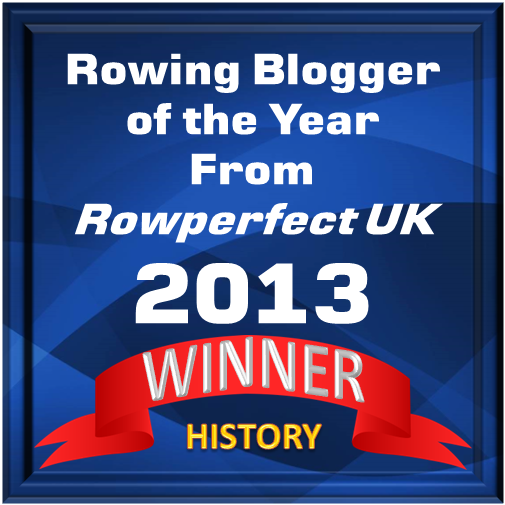 Were generous benefactors of the Tideway Sculler’s School in that decade paying for the George Sims (Eel Pie Island) boats the Sculler’s VIII raced in as Great Britain in the 1966 World Championships and the 1969 European Championships. And Gallagher’s issued premium cards which included several featuring oarsmen. I suspect that Tim and Greg have some in their drawers – as do I.